Wishbone Day: Just 3 days to go! Wishbone Day is almost here! I'm excited! It's brilliant to see so many great celebrations being planned around the world. We know that in 2011 Wishbone Day will be celebrated across Australia, Oceania, North and South America, Asia and Europe. This year we have welcomed many new friends from around the world and look forward to this growing trend as Wishbone Day reaches more people to raise awareness. If you are not represented on our Wishbone Day map (below) please drop us an email to let us know that you will be celebrating Wishbone Day where you live. We want to acknowledge everyone celebrating Wishbone Day in the world!! Wishbone Day celebrations have been busy in the planning phases. Ribbons, t-shirts, posters, jewellery, trinkets and other yellow decorations have filled living rooms, offices and school class rooms across the world in preparation for celebrations this week. We know there's going to be Wishbone Day classroom and office activities, picnics, parties, morning and afternoon teas. If you're still looking for some creative inspiration for your own Wishbone Day celebrations take a look at the Wishbone Day Bright Ideas shared by our Wishbone Day supporters around the world. If you have something to share drop us a note and let us know. We love reading your comments - so please click on the comments link below and tell us what you're planning. 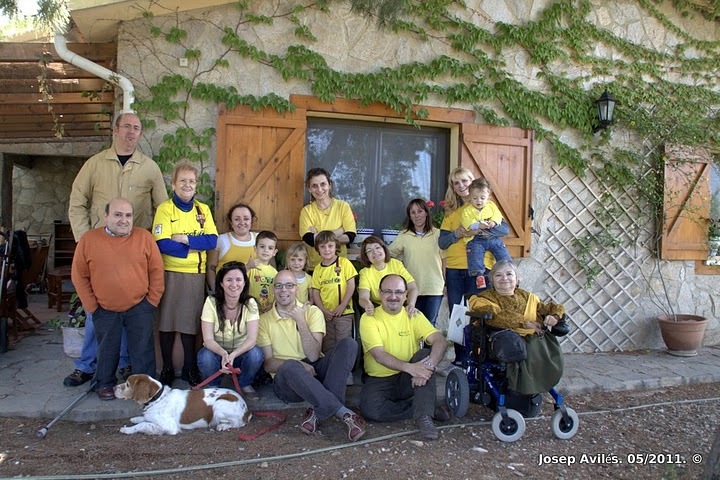 Our friends in Spain have begun our Wishbone Day celebrations with a pre-Wishbone Day family reunion. A great day had by all and lots of yellow to raise positive awareness of OI. Remember we LOVE your photos of your Wishbone Day celebrations - so please share them with us! We want the world to see how Wishbone Day 2011 was celebrated around the world. Send your photos to info@wishboneday.com so we can include the images in our Wishbone Day 2011 video slideshow! Jo, we have used the logo and linked back to Wishboneday.com on our blog! Thank you for the fabulous little wishbone art work! Cayden loves that little guy! !